The Quebec International Bonspiel (QIB) is one of the oldest uninterrupted amateur sporting competitions in the world, having run each year since 1913 in the city known as the cradle of curling in North America. The sport was introduced here in 1760 by the Scottish soldiers who were part of the British forces that participated in the Battle of the Plains of Abraham. It all started in the marvellous city of Québec – doorway to the continent, one of the oldest and most beautiful cities in North America. History surrounds you. In 1924, George J. Cameron, an enthusiastic Winnipeg curler, dreamed aloud his idea of uniting the east and west of Canada through curling. Cameron was president of W. L. Mackenzie and Company, the western representative of the Macdonald Tobacco Company since 1880. Two of his friends, Walter Payne, known as Manitoba's "thane of curling," and John T. Haig, a past president of the Manitoba Curling Association, encouraged his thinking. On his next trip to Montreal he placed his idea before the tobacco company. His proposal to cement the two islands of curling-east and west, irons and granites-was accepted by the company. While the theory was easily agreed, translating theory into practice was another matter altogether. 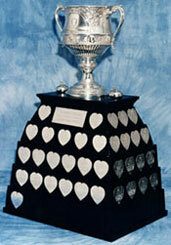 The Macdonald Company agreed to support the establishment of the Macdonald Brier trophy, as a key part of the 1925 Manitoba Bonspiel. In addition to receiving the honor of having their names engraved on a magnificent silver trophy (later rechristened the British Consols trophy) the winners would receive an all-expense trip to eastern Canada for a series of friendly games against eastern teams. In 1925, the winner was Howard Wood of Winnipeg, whose rink of Johnny Erzinger, Vic Wood (brother) and Lionel Wood (son) traveled east in the spring of 1925. 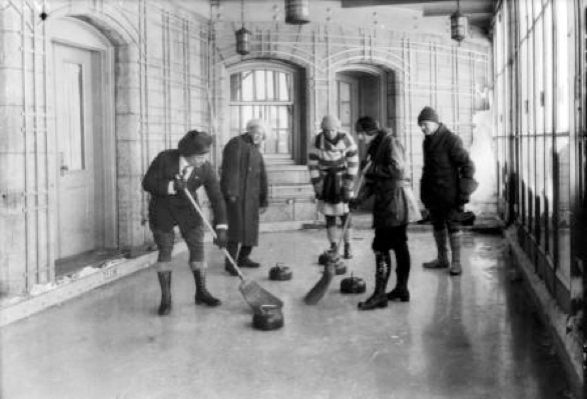 In 1926, the winners of the Macdonald Trophy event-the George Sherwood rink-were sent east to participate in the famed Quebec Bonspiel, where they won the Holt Renfrew Trophy. This second visit attracted greater attention, and subsequent conversations between Cameron and Thomas Rennie of Toronto (and others) led to the concept of a national event, with inaugural play to be held at the Granite Club in Toronto in 1927. And so the Brier (a Macdonald Tobacco trademark name) as the national curling championship of Canada, was born.